Hi’ilawe Falls (and it’s twin, Hakalaoa) are the tallest waterfalls on The Island (not the tallest in the State (Olo’upena Falls, which is 2,953 feet (900 meters), but it is the 138th tallest in the world. Nowhere near the tallest (it’s “only” 80 feet tall (24 meters) but estimated to be one of the most photographed waterfalls in the world, is Rainbow Falls (Waiānuenue, which means “Rainbow Water), in Hilo. The Falls is really beautiful, but probably the main reason that it’s photographed so often is because the parking lot goes right up to it, so it’s very easy access. 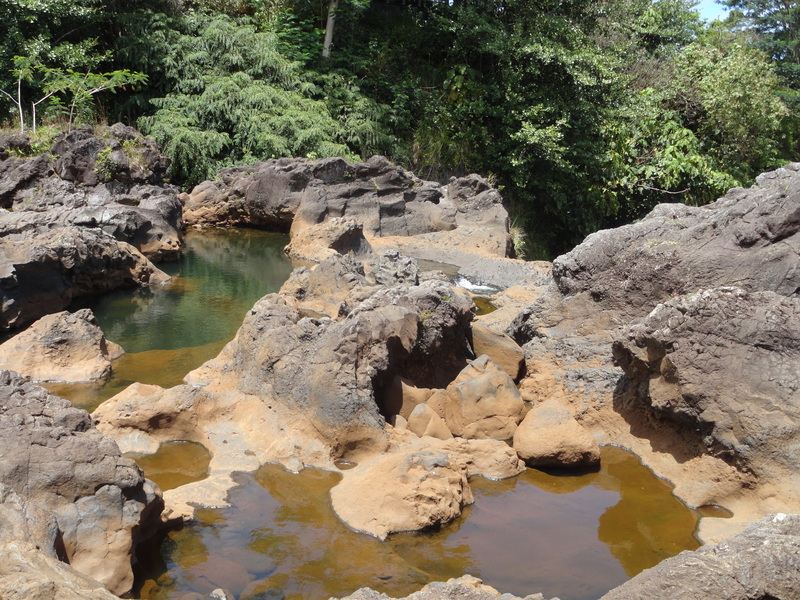 There’s a nice little walk upriver from the parking lot, and if the water level is lower, you can climb along the rocks shaped and carved by the swirling water. 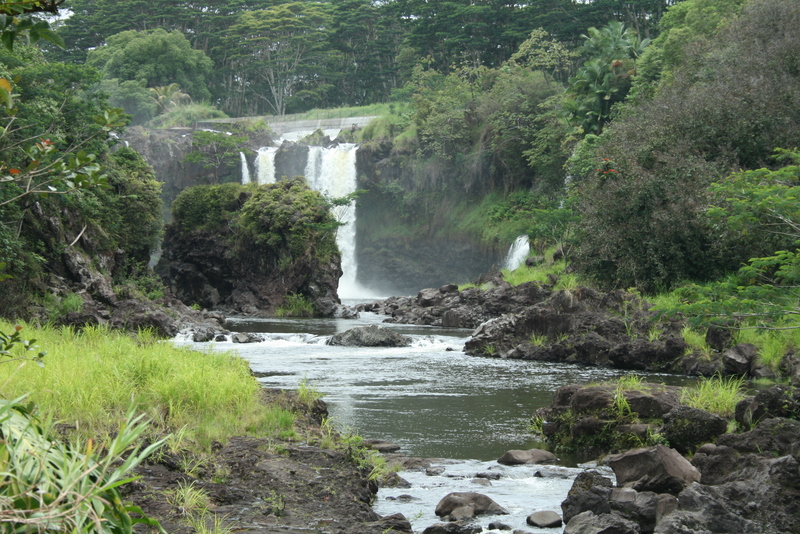 Nearby, are The Boiling Pots and Pe’e Pe’e Falls. First of all, it’s pronounced something like: “Pay-ay Pay ay”, just so you know. 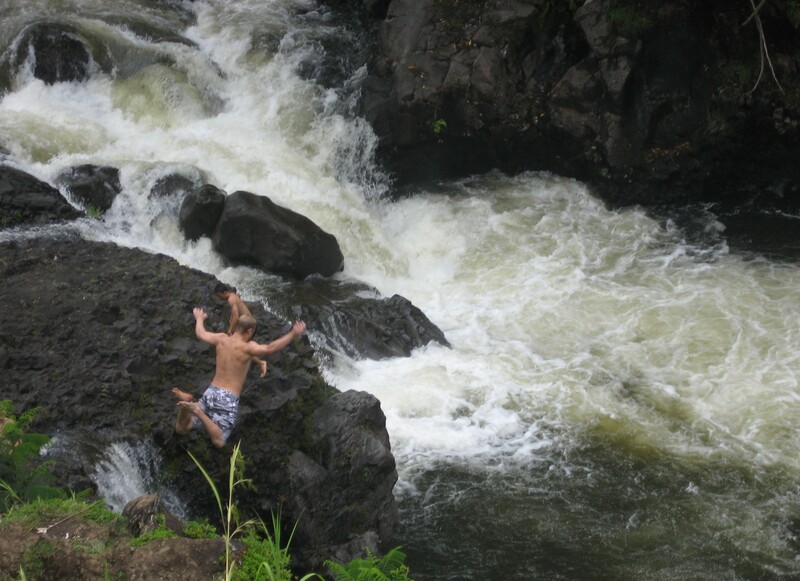 Fed by the Wailuku River, Pe’e Pe’e Falls is runs along, finding its way through and around old lava tubes, creating rapids and careening through pools that make the water look like it’s boiling. 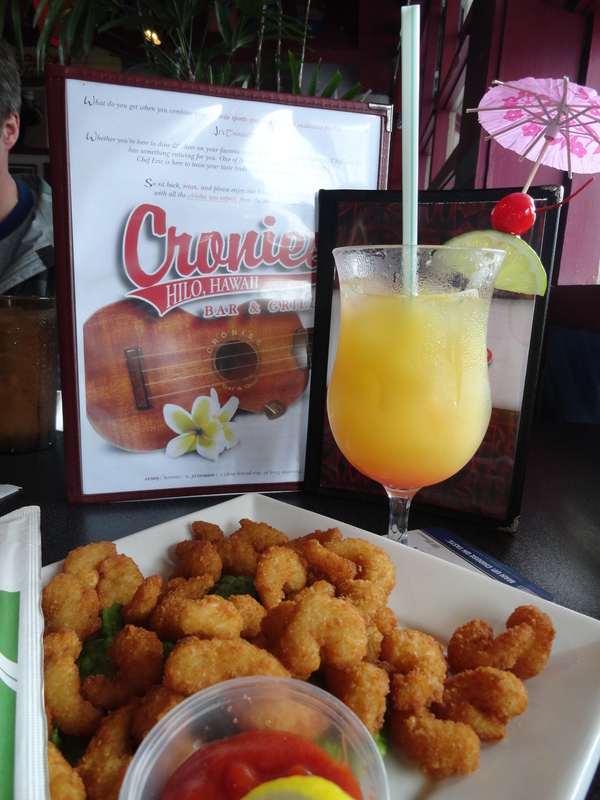 We always kick off our Hilo-visit with a trip for lunch at Cronies Bar and Grill – I get popcorn shrimp and a Hilo Hula drink every time. I’m always really hopeful that someone else will order their Bucket of Onion Rings, and then be willing to share, because they are SO GOOD!! 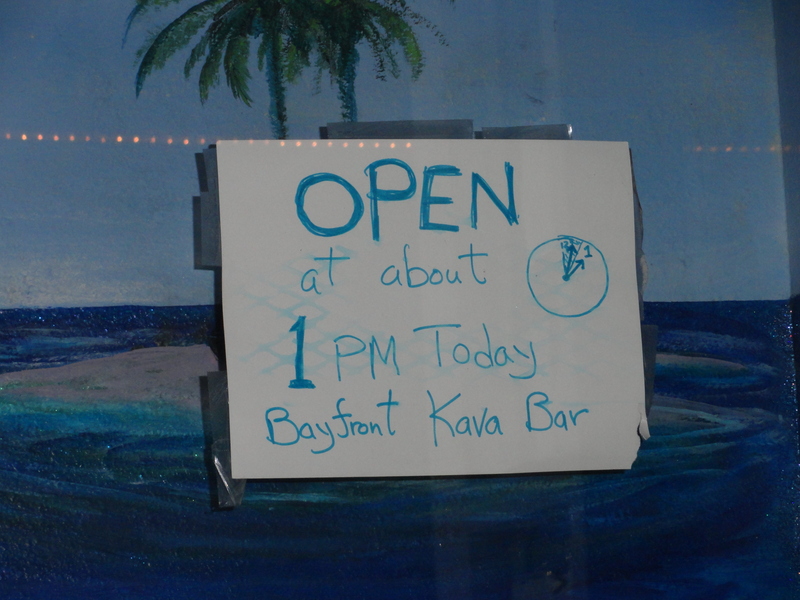 Cronies is right on the main strip alongside the wharf, near the farmers market, the Kava bar, and Cafe Pesto. 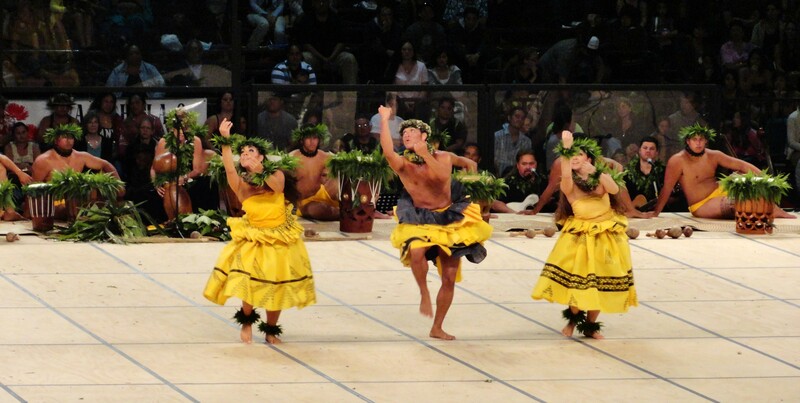 If you go to Hilo at the right time of the year (April), you should go to the Merrie Monarch Festival. 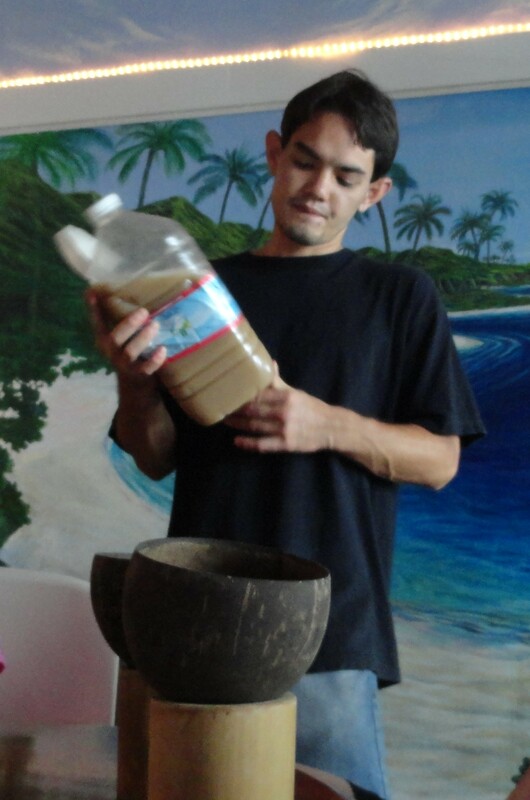 The Festival is a week long, celebrating Hawaiian arts and culture. It includes art exhibits, performances, a parade! 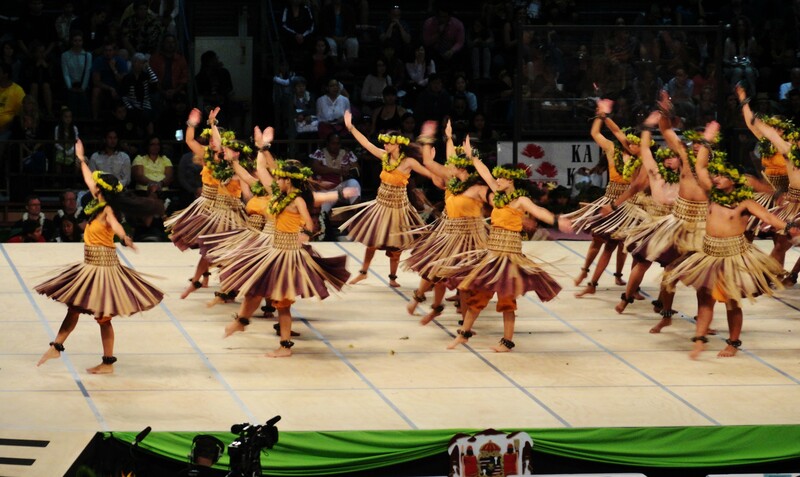 and a 3 day hula competition! Tickets to the Competition are hard to come by (and by “hard to come by”, I mean “almost impossible”), but there is also one day that is a hula exhibition that is free to the public. 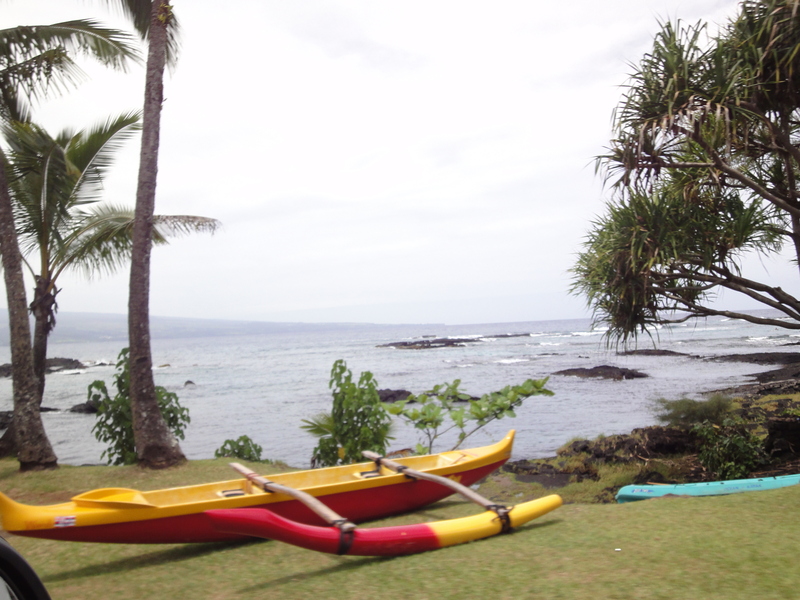 If you meander down Kalanianaole Avenue (starting at Ponds Hilo Restaurant), there are many snorkelling and kayaking and beach opportunities – we’ve only driven by, but will eventually give some of the places a try. 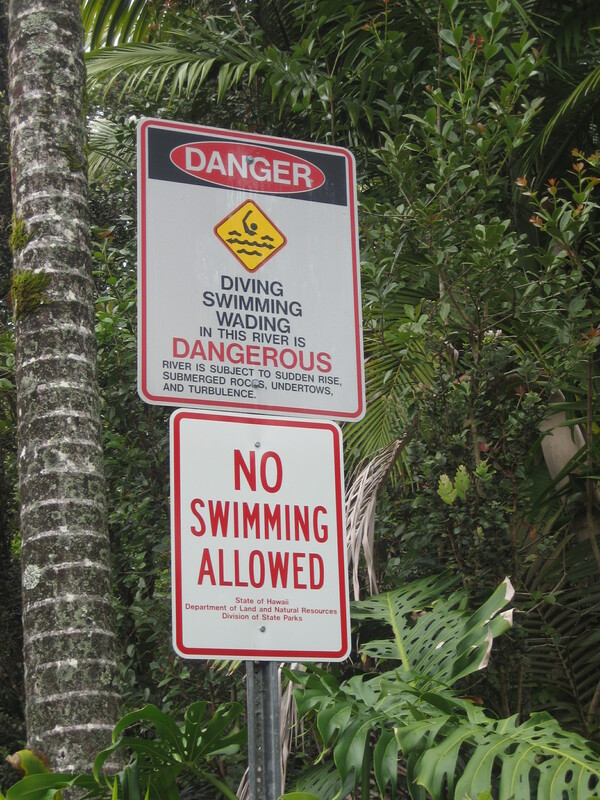 We were told to go to Richardson Beach Park, but there’s also Leleiwi Park, Wai O’lena Beach Park, Carlsmith Beach Park, Kealoha Beach Park, Onekahakaha Beach Park, Reeds Bay Beach Co Park, and Keaukaha Beach Park… Seems like a good selection! 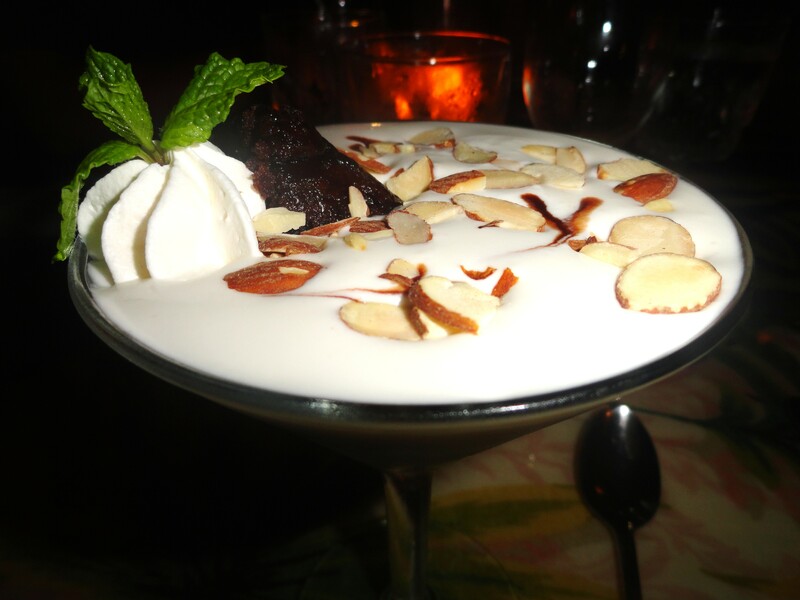 Ponds Hilo “Restaurant on the Edge” is on the corner of Kalanianaole Avenue and Banyan Drive, which I discussed in my last Hilo blog. For years, I’ve been wanting to go there for dinner, and finally made it this year! 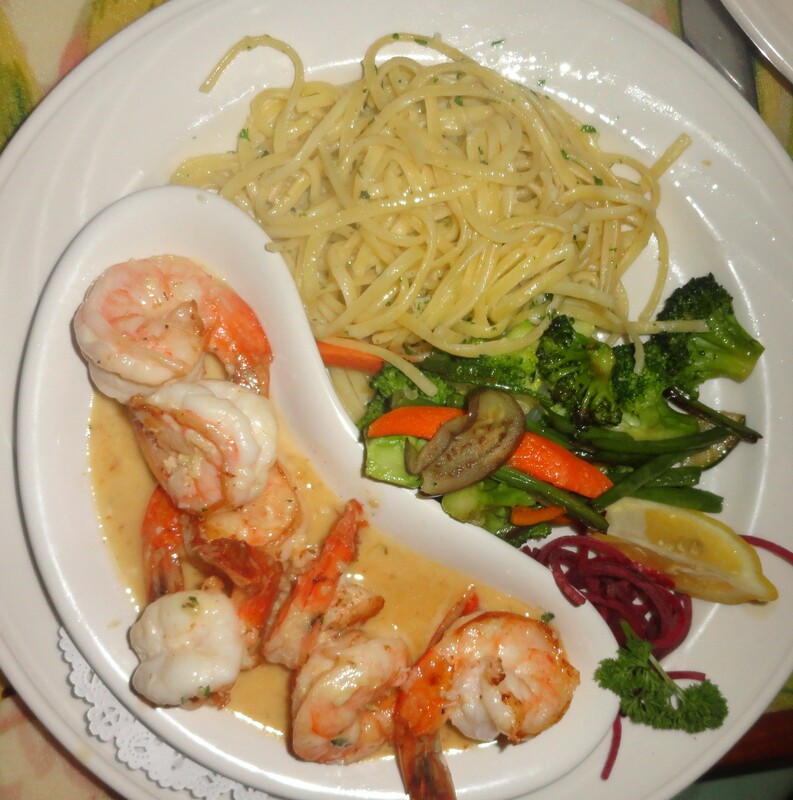 Not only was the food DELICIOUS!! 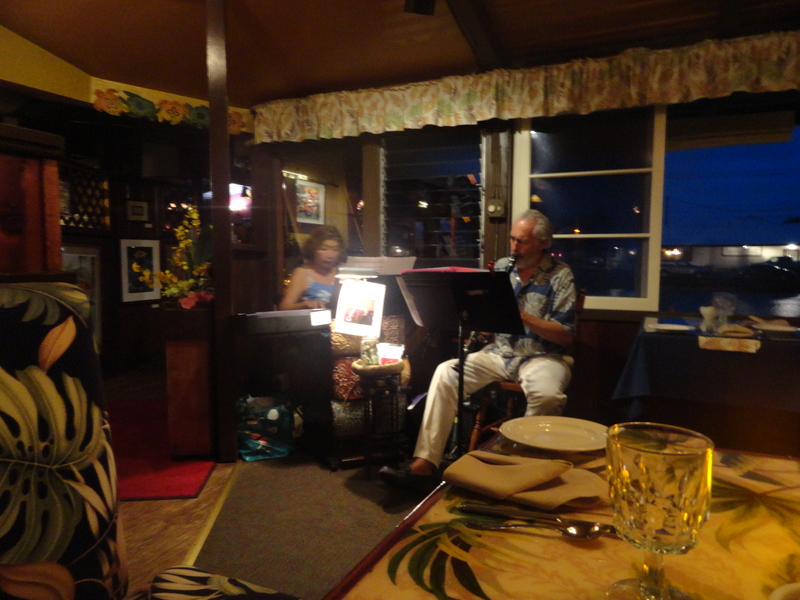 but they also had live entertainment – jazz, the night we were there. Check out Hilo – I think you’ll love it!